THE SHATTER VERSUS Wallace saga was again the main topic up for discussion at the latest round of Leaders’ Questions in the Dáil. Both the Fianna Fáil leader Michael Martin and Independent TD Clare Daly questioned the Justice Minister Alan Shatter’s motives for leaking confidential information about Wexford TD Mick Wallace’s encounter with gardaí. Tanaiste Eamon Gilmore, who was taking Leaders’ Questions today as the Taoiseach is in Brussels facing questions about Ireland’s tax arrangements with multi-national companies, vehemently defended minister for justice. Martin told the house that Shatter’s “half-hearted apology” to Wallace in the Dáíl “missed the point” and that it was an “abuse of his position”. “The garda commissioner is entitled to brief the minister of serious issues… but the minister should treat such information with confidence,” added Martin. 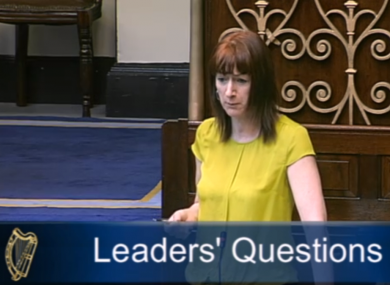 When it was deputy Daly’s turn she put it to Gilmore that Shatter treated the “house like cabaret” and was scathing about the comments he made on RTÉ’s Prime Time. She outlined the “difficult” position that both whistleblowers found themselves in when they tried to bring the penalty points scandal to the attention of relevant authorities. She added that they were “warned off” and “tried to be silenced”. “I think it’s been high-time that legislation is introduced that will protect whistleblowers… without fear of their job or without fear of any discrimination,” said Gilmore. He added that legislation is currently being drawn up which will be put before government shortly. Email “Greater protections for whistleblowers after penalty points furore”. Feedback on “Greater protections for whistleblowers after penalty points furore”.